After several weeks of hard work on the home-front, my thoughts are on activities which are straight-forward and simple. 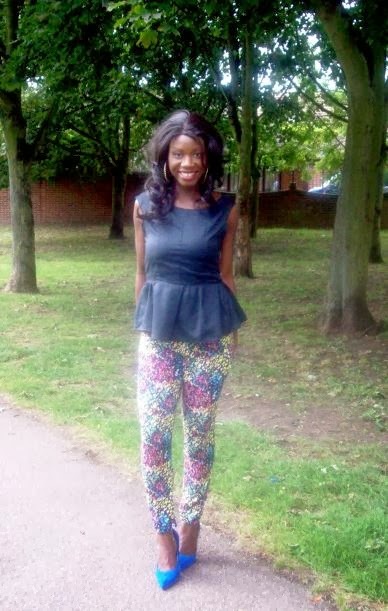 2012/2013 has seen us in the peplum style trend for a while. So in this post, i'm saluting the style for its versatility and commonality around the world. The peplum is indeed a classic style that has a way of complementing many feminine shapes. Some say it's supposed to create the illusion of an hourglass physique amongst many other thoughts about it. Furthermore, we have seen the peplum style stapled to trousers, tops, skirts and shorts, and when combined with a wide range of fashion pieces it can look amazing! One of the reasons why i'm hinting to you, my readers about more upcoming styles i look forward to sharing for the 2013 fall and will see us through to early spring 2014. Follow the easy steps below to create this rare classic black peplum top. To create this top, i used satin backed dupion fabric. I suggest using a medium-weight fabric like the one mentioned to help accentuate the flare. The key to creating a flattering peplum top is to have the top flare out at the mid-portion of the stomach, just above the navel. If you wish to have it longer, try experimenting with wide and thin cut belts to alter and complement the flare of the top. Wear with straight cuts that are long or short and best combined with heels or formal flats.